Need to get in and out the gym fast! Then our 30 minute lunchtime fitness classes are a great way to make the most of your day and make sure you’re investing in your health as well as your work. Get maximum results in minimal time with our lunch time High Intensity Interval Training sessions. Our gym is a little bit different, you see we don’t do slow and we don’t do boring. When it comes to exercise, burning calories and getting people fit we like to hit things (… punch bags and pads) and we like to do things fast! It’s why, when you try your first session, don’t be surprised if you’re breathing heavy, sweating a lot and gasping for water. If you’re after a 45 minute on the treadmill or an hour on the cross-trainer – then that’s not us. From years of training top level athletes we know when it comes to getting seriously fit, torching calories and changing the way people look – training hard and fast using “High Intensity Interval Training” is what works best for our members. Plus we throw in a few of the basics, the important exercises you remember from school – squats, lunges, press-ups, burpees (… remember them) and a healthy dose of skipping. Our training is varied, our lunchtime fitness classes are fun and our training is a tried and tested way to burn an hours worth of calories in just 30 minutes. 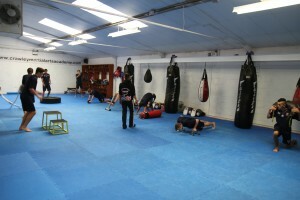 The very best way to find out more about our classes, see if they’re for you is to visit the gym and try a class. They’re reasonably priced (… just £5 for the lunchtime session and cheaper if you become a monthly member) and a lot better than wasting your time at the desk talking more work. Plus when you’re here you can see the other classes we teach – morning fitness classes, kids martial arts classes, evenings and weekends too. 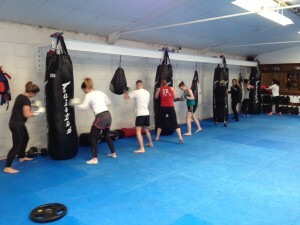 We’re a family run gym, small independant and very different from the mainstream commercial gyms. We’ll even know your name!